While much of North America is bracing for the Snowpocalypse 2011, my thoughts are turning to sunny Florida. I’m not just thinking of an escape from the cold, dreary weather that February brings with it. No, I’m thinking of the warm hospitality of sunny Orlando and SQLConnections. I’m going to deliver a couple of sessions at the conference. Check out all of the sessions. Transact-SQL is not a very difficult language to learn. As long as the syntax is correct, it can be quite forgiving. However, to truly get the best performance from your SQL Server, careful consideration should be given to the structure and logic of the queries. In this session, we’ll discuss some Transact-SQL tips and tricks that can be employed to help you write better queries, allowing your server to perform better. As I tune into the weather channel and see the nasty arctic weather that’s pelting almost 1/2 of the continental United States, I can hardly wait. I hope to see you there, too. “The human brain starts working the moment you are born and never stops until you stand up to speak in public.” observed Academy Award winning movie producer George Jessel. I think there is some truth to that for many of us. As a regular speaker at conferences, SQLSaturdays, and other organizations, I’m often asked about public speaking. Some ask about preparation. Others ask about getting started. The most common question is about selecting a topic. That’s one question I can’t answer; I can only share how I do it. Let’s start with the mindset. The way I approach selecting a topic is to first remind myself that I’m not claiming to be an expert in the topic. In fact, I don’t claim to be an expert in anything, really. I don’t pretend to know everything about a subject. When I speak, my goal is simple – to share my experiences and hopefully help someone else who’s about to go through something similar. Whether it’s troubleshooting a poorly performing server or helping to coach a new technical manager, I want to give them the benefit of my trials and observations. This takes the pressure off of me. As I think about potential topics, I usually consider a few things. First, I look for topics that I’m already pretty familiar with but would like to learn even more. Most every session I give requires me to do research. Preparing to teach something is the best way to really learn it. So, if you’re going to have to do some research, it may as well be in something that interests you, something you’d like to learn more about. I also look for topics that are underserved in the community. 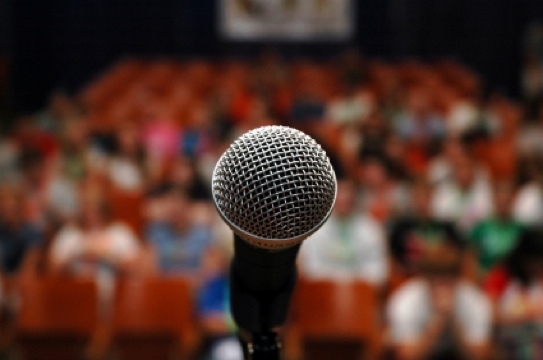 Or put another way, I seek topics that have broad appeal but haven’t been done over and over again by other speakers. These topics aren’t necessarily obvious at first, but if you persist you can usually identify a few. Finally, I tend to favor entry-level to mid-level topics. Sure, there’s a lot of glory in providing the very high end sessions, but the vast majority of attendees will not be ready for that depth of content. There’s a great need for entry-level to mid-level sessions. This goes back to the prior point: if other speakers tend to gravitate toward the high-end sessions, the mid-level sessions may be underserved in the community. Once you’ve selected a topic, the next step is to write the abstract. Creating an abstract is an art. You’ve got to give people a reason to come to your session (or the program committee a reason to select your session for the conference). Stating just the facts about the session in a dry way won’t do that. Make it catchy. Make it compelling. The body of the abstract supports and clarifies the title. I usually start with a description of the problem and then talk about the information I’ll convey in the session to help solve the problem. Consider this real-world abstract that I’ve delivered many times at conferences and Lunch & Learns. In this session you’ll learn some of the keys to conducting an effective meeting. You’ll gain practical tips for making your meetings more productive and dramatically improving one of the most inefficient parts of your day. You’ll also learn how to help improve meetings your don’t run. Once you’ve created the abstract, share it was a few people that you trust to provide candid feedback. Ask them for help with refining your draft to a polished and professional form. Then you can submit it to the local user group, SQLSaturday, Lunch & Learn, or conference. A couple of years ago, I shared my experiences with and techniques for creating presentations in an article I wrote for Simple-Talk. So what are you waiting for? Get out there and start speaking. Got any other tips that I’ve missed? I’d love to hear from you with your tips for selecting a topic. Each year, the Georgia Bulldogs and the Florida Gators meet on the college grid iron in what’s called the world’s largest cocktail party. I’ve never been; in fact I’m probably not welcomed since I’m an alumni of a rival school, the Auburn Tigers. War Eagle! You Can’t Handle The SQL! Last week, I attended another “world’s largest” event: the PASS Community Summit. With over 3,000 attendees, it’s the largest SQL Server-only event in the world. There are over 150 break out sessions, it has several rooms for hands-on labs complete with Microsoft folks to help you with specific SQL issues, and there are plenty of exhibitors there to see. It’s got more technical content that your mind can absorb without exploding. Don’t believe me? Just watch Dr. David DeWitt’s Thursday morning keynote address and then tell me how your brain feels. Mine rapidly turned to mush as neurons overheated while struggling to process everything he said. But I don’t really think of PASS in those terms. No, to me all of the education at PASS is just a side benefit; it’s the icing on the cake. I think of the Summit as the World’s Largest SQL Family Reunion. Each fall at this community event, I have the opportunity, no the absolute pleasure, to spend time with friends from around the world. It’s a special week that I look forward to all year long. Some of the traditions are deeply rooted and planned months in advanced. This year’s SQL Karaoke found over 80 people belting out the tunes in American Idol-like fashion. SQLKilt is another tradition growing in popularity. Plus there are the breakfasts, the dinners, and the after parties. But my favorites are the impromptu gatherings. Having coffee with a friend from Europe, sharing a lunch table with someone I’ve only met through Twitter, and bumping into good friends from other states in the hallways. That’s what gets my blood to pumping and brings a smile to my face. The technical content is good, but it’s the relationships that matter most to me. So, to everyone I saw in Seattle last week: Know that I cherish the time that we got to spend together. And if we didn’t get a chance to catch up, let’s not let that happening again next year.